Only a handful of first American edition remain. Wordcraft of Oregon website only. ​"Backwoods Noir" at its best. For generations the Erskine clan has lived in poverty and isolation on North Mountain, shunned by the God-fearing people of nearby Gideon. Now, Albert Erskine comes down off the mountain hoping to change the future for his brothers and sisters and sets in motion a chain of events that will change everything. Inspired by the true story. From best-selling novelist Lauren B. Davis comes the deeply compassionate story of what happens when we view our neighbors as "The Other," as well as the transcendent power of unlikely friendships. Our Daily Bread is a compelling narrative set in a closely observed, sometimes dark, but ultimately life-enhancing landscape. Lauren B. Davis' vivid prose and empathetically developed characters will remain in the reader's mind long after the final chapter has been read." "I'll never forget this book, the stunning power of the descriptions, the attention to detail, the riveting plot, the fully-realized characters--this is storytelling at its very best." "Wow! From the first chapter of Our Daily Bread, "up here where the view was like heaven and the living was like hell," I was hooked--by the characters, by the flow, by the clean , rhythmic prose. This is a novel that will make you want to do something about poverty, hunger, ignorance and the people who are subjected to such conditions. An outstanding, absorbing, page-turning novel." "Rendered with gorgeous prose, this compact, fast-moving novel features an astonishing range of tones, from hope to heartbreak, from black humor to white-knuckle terror. It will stay with you long after the covers are closed." 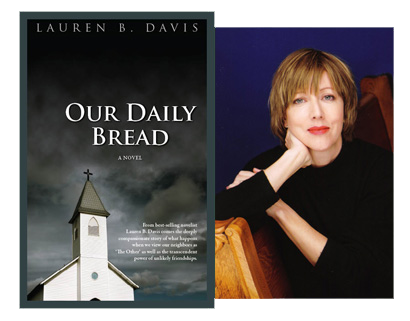 Lauren B. Davis is the featured author for the October 2011 issue of SERVING HOUSE JOURNAL. Read the first chapter of OUR DAILY BREAD. "...a powerful, harrowing, and deeply unsettling work. It's the sort of novel that keeps you reading even as your skin crawls and your blood pressure mounts...Our Daily Bread proceeds like a noose tightening...a stark, beautiful, sad and frankly terrifying novel. Our Daily Bread is finely crafted, with careful attention to characterization, style and pacing. It succeeds on every level..."
LAUREN B. DAVIS is the author of the bestselling and critically acclaimed novels, The Radiant City, a finalist for the Rogers Writers Trust Fiction Prize; and The Stubborn Season, chosen for the Robert Adams Lecture Series; as well as two collections of short stories, An Unrehearsed Desire and Rat Medicine & Other Unlikely Curatives. Her short fiction has been shortlisted for the CBC Literary Awards and she is the recipient of two Mid-Career Writer Sustaining grants from the Canadian Council for the Arts. Lauren reviews books for The Globe & Mail and The Literary Review of Canada, leads monthly Sharpening the Quill writing workshops in Princeton, New Jersey.